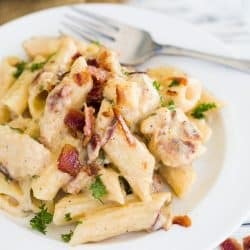 Savory Pasta smothered in a creamy ranch sauce with bites of juicy chicken and crispy bacon. 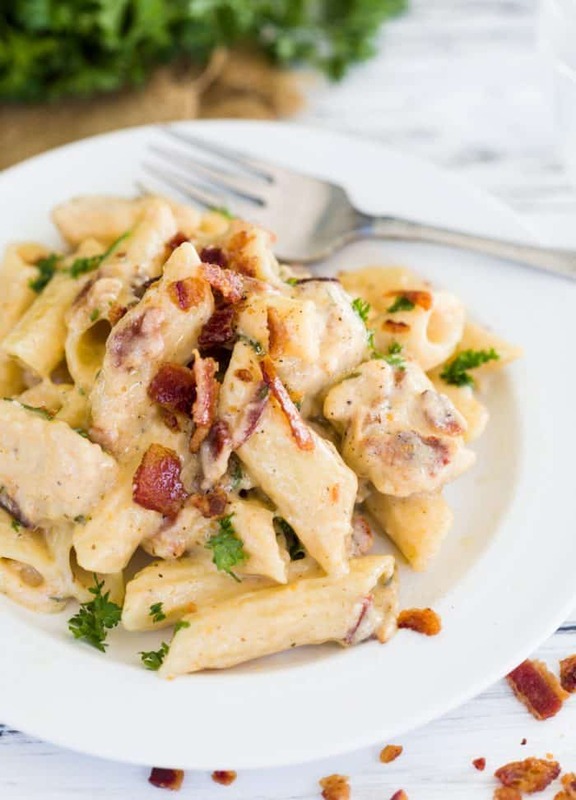 I have been making this bacon ranch chicken pasta since 2014, it’s one of those unforgettable successes that you won’t forget once you make it once. 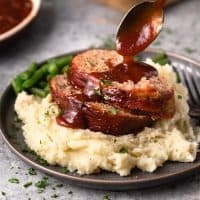 The ranch seasoning that’s added to the creamy cheese sauce brings out this amazing new flavor that’s a nice change from your standard Alfredo sauce. 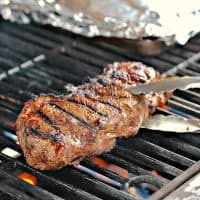 So let’s go over some quick Q&A and get that bacon going! -When cooking bacon on the stove-top, cook it low and slow and you’ll get evenly cooked, crispy bacon. –Use High quality bacon as it will always yield a better result. It’ll cost you more, but it’s worth it for the quality. You get what you pay for with bacon. -Let the bacon sit at room temperature for 5 minutes prior to frying. Bringing the temperature down to this state makes it better for frying. 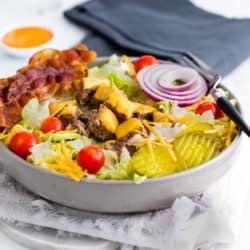 -Use tongs to turn the bacon occasionally as the sides begin to curl to ensure even cooking. Can I freeze this pasta? 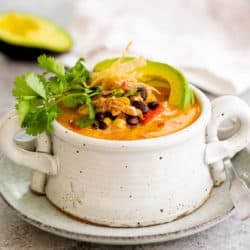 Although you can, (and I have), cream-based sauces and soups are trickier to freeze as dairy products change in consistency when frozen and reheated. What if I don’t have whole milk? -Anytime you add milk or cream to heat, you run the risk of having it curdle. The extra fat in whole milk makes it less likely to curdle. You can also use half and half in this recipe, or 1/2 evaporated milk 1/2 water. Make sure you whisk it constantly as it cooks and that you don’t increase the heat too high. 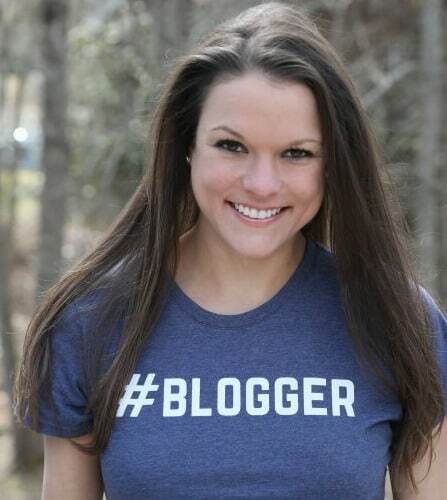 Are you a Ranch lover? 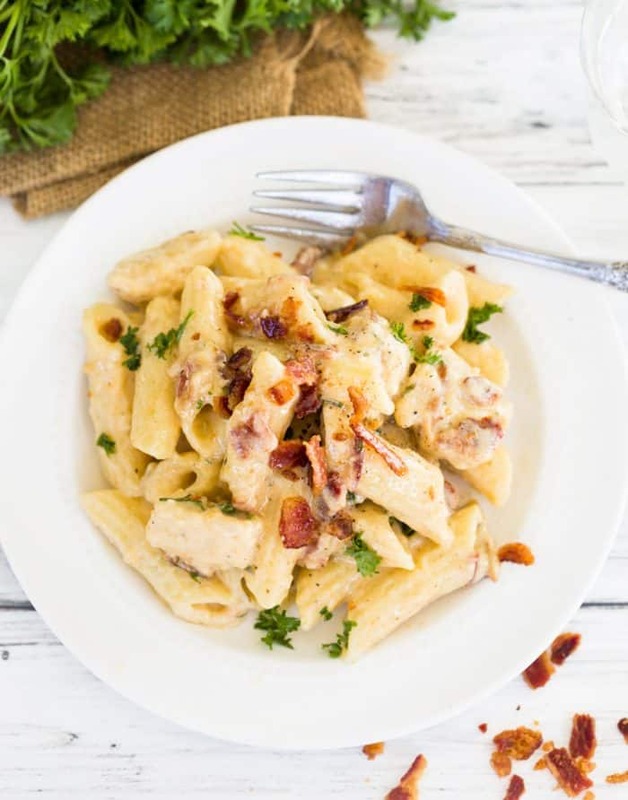 Savory Pasta smothered in a creamy ranch sauce with bites of seared chicken and crispy bacon. In a large pot, cook pasta according to package directions. 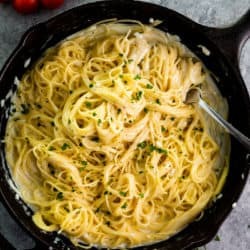 Drain, drizzle with a touch of olive oil to prevent the noodles from sticking together. Set aside. Meanwhile, cook the bacon slowly on low heat, turning the it over as it begins to curl for even cooking. Leave the bacon drippings in the pan and set the bacon on paper towels to drain the excess grease. Note: If you don’t have much for bacon drippings, add 1 Tablespoon of butter to the pan and melt. Cut the chicken into bite-sized pieces and sprinkle with desired amounts of salt and pepper. Coat the chicken in the flour. Add the chicken to the pan with the bacon drippings and cook over medium-high heat for about 5 minutes on each side. Leave them alone as they cook to get a nice golden sear on them. Once cooked through, remove the chicken from the pan. Add the garlic to the pan and sauté for one minute. Temper the milk by heating in the microwave for 30 seconds. 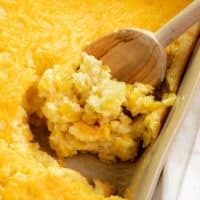 Gradually whisk it into the pan, then whisk in the cheese and the Ranch seasoning. Stir constantly. The sauce will continue to thicken as it cooks. 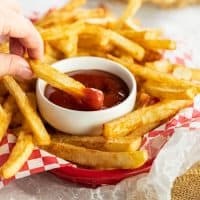 If thicker sauce is preferred, combine 1 tablespoon of cornstarch with 1 tablespoon of cold water. Add it to the sauce in increments, giving it a chance to thicken in between, until desired consistency is obtained. Crumble the cooked bacon and mix it into the sauce along with the cooked pasta and seared chicken. Let it heat up for 1-2 minutes, and serve! 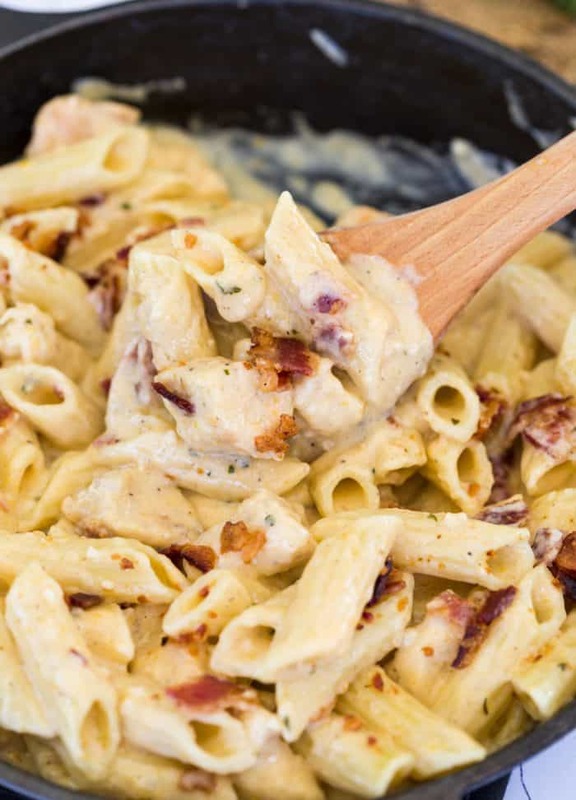 I love pasta, ranch dressing, bacon & chicken. 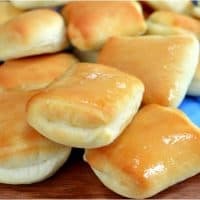 How could I not love this recipe? Hi Sonnia! My thoughts exactly! 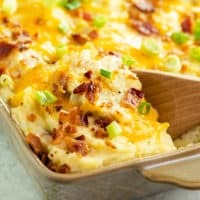 I have quite a collection of bacon ranch recipes at this point, and I actually made some cheddar ranch crackers last night, I think I have a Ranch addiction! 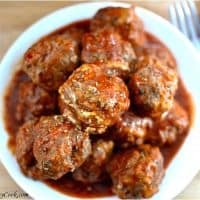 I hope you have a chance to try this recipe soon, you will love it! Have a great weekend! Ohhhhh man. You are in for a GOOD meal, I’m jealous! 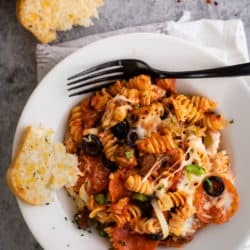 I’m going away this weekend and subject to whatever food I’m given, (which should be good), but it’s no Bacon Ranch Chicken Pasta! Can’t wait to hear what you think of it! 😊 PS- I give you credit for planning your weekend meals ahead of time! I try so hard to do that, it’s not my strong suit!